Todd Gordon. Imperialist Canada. Winnipeg: Arbeiter Ring Publishing, 2010. 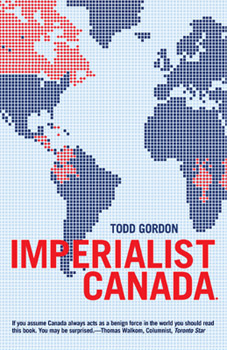 Todd Gordon’s new book provides a compelling case that Canada is an imperialist country in its own right. His factual presentation of the matter will reinforce what is already a growing perception among Canadians. The traditional view to which Gordon refers is expressed by the title of Linda McQuaig’s 2007 book, Holding the Bully’s Coat. This title reflects the widely held assumption that Canada serves U.S. interests rather than its own. An important correction was provided by Yves Engler’s The Black Book of Canadian Foreign Policy (2009). However, Engler did not address the structural roots of Canadian policy (see review). Imperialist Canada explains that Canada’s increasingly imperialist actions in national and international affairs flow from the inherent tendency of capitalism towards over-accumulation. Gordon also emphasizes that “primitive accumulation” (seizing common property to accelerate capitalist exploitation) continues to play an important role. This is not the first book to describe Canada as imperialist. However, Gordon argues that Canadian imperialism directed against Indigenous people within Canada is ongoing and central to the nature of Canadian capitalism. The book is an important advance over previous explicit characterizations of Canada as an imperialist state that did not develop this side of the analysis. Chapters on “Violence and Eco-Disaster: Canadian Corporations in the Third World” and “Coups, Invasions and Occupations” offer case studies of key actions by Canadian imperialism abroad. The economic, diplomatic and military policy supporting Canadian corporate interests are systematically addressed in “Creating a World After its Own Image” and “Making the World Safe for Capital.” The attention given to the record of Canadian mining corporations at home and abroad is a particularly useful contribution. Imperialist Canada raises several questions that need to be clarified and discussed by supporters of its basic analysis. The first that comes to mind is the book’s near-equation of Canada’s relationship with Indigenous peoples within Canada to its relationship with countries in the Third World. Are there important differences that also need to be explored? And what about the internal imperialism against Acadians and Quebec that is not discussed but is also surely central to any understanding of Canada? A second point is the ambiguity about what is new about Canada’s more obvious imperialist stance in recent decades. Does the dramatic rise of its foreign investment and its lust for resources and labour on Indigenous territories within Canada register qualitative change in Canada’s imperialist status? Part of understanding Canadian imperialism is its coming into being – when and how did this occur? Gordon’s focus on the recent decades of neo-liberalism and globalization suggests a more recent turning point than is assumed by other characterizations of Canada as imperialist.